Outsource2india was approached by a UK-based startup which was making headlines with its innovative foray into computer programming and IT services. 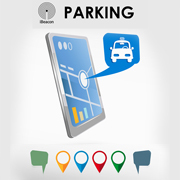 They wanted us to develop a parking app solution based on Apple's iBeacon protocol - a revolutionary technology which enables smartphones and other devices to perform certain tasks in close proximity to an iBeacon. Although many retailers and app developers use iBeacon technology for advertising, our customer had a unique idea for leveraging this technology to find parking spaces in CBD areas and in Global cities where finding parking space is a big challenge. The client also wanted the app to function even when the Bluetooth was switched off for better driver convenience. The iBeacon technology works with Bluetooth LE devices. Since Bluetooth is the primary mode of communication, users need to keep their device Bluetooth switched on in order to communicate with the Beacon. Since the customer specifically requested that the parking app should be able to quickly track nearby beacons for empty parking spaces even when the Bluetooth was switched off, our developers faced a daunting challenge while trying to configure and sync the location beacon with the app. After carefully analyzing the client's requirements, our developers decided to develop the app from the ground up keeping in mind the driver's ease of use. We were able to achieve the client's primary requirement - that is ensuring that the app was able to detect beacons even with the Bluetooth was switched off by incorporating pre-configured geo-fencing technology within the app. This ensured that the user always received an alert to switch on Bluetooth based on the proximity to the Beacon. The app was also highly accurate and was able to notify users about nearby empty parking slots when they were within a 10 feet radius of the beacon. Apart from these, several other requested features, such as the ability to view the parking location remotely, view previous parking history, etc. was also enabled within the app. Upon its release in the App store, the app garnered a massive fan following and witnessed steady downloads day-upon-day. We also helped the client provide regular updates to the app, thereby leading to a satisfactory and mutually beneficial partnership. We at Outsource2india believe that mobile apps are the new frontier in technological innovation and our myriad project dealings with global clients are a testament to our working with cutting-edge technology to develop mobile apps that actually make a difference. We have developed countless iOS, Android, and Windows apps for different businesses, and our mobile app development expertise of 14 years allows us to offer differentiated services at cost-effective rates to our clients. Contact us right now for a no-obligations quote!